Andrea Ferrari was born in La Latta, Parma on August 13, 1850. In 1873 he was ordained to the priesthood and worked as a parish priest and then as the vice-rector of the seminary in Parma. In 1877 he was appointed the seminary’s rector. He was also a professor of physics and mathematics, fundamental theology, ecclesiastical history and moral theology. 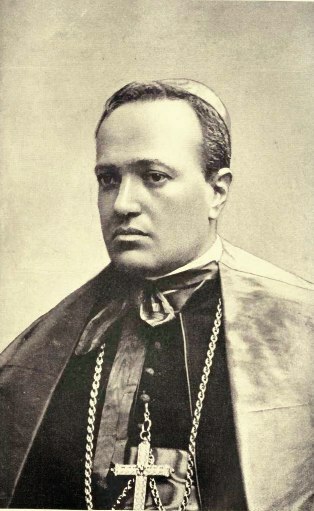 In 1890, Pope Leo XIII appointed him Bishop of Guastalla, and then in 1894, to the cardinalate for the diocese of Milan where Andrea Ferrari remained until his death in 1921. Cardinal Ferrari participated in the conclaves of 1903 that elected Pope Pius X and of 1914 that elected Pope Benedict XV. At the time of his appointment to the episcopate of Milan, Ferrari took the name Carlo as a middle name in honor of Saint Charles Borromeo who had also been the Cardinal-Archbishop of Milan and who was a great inspiration to him. During his episcopate he carried out four visitations of the vast diocese in the manner of Charles Borromeo. 102 churches were built during his twenty-five years in Milan and he also initiated the work of embellishment and enrichment of the cathedral. He founded several associations and had a profound influence on the Church. He was however considered controversial in certain circles. During the anti-modernist time of Pope Pius X, he was unjustly and unfairly accused of Modernism. While he was no Modernist, the feeling that he was sympathetic to its tenets led to a period of poor relations with Pius X. In a pastoral letter in 1908, Cardinal Ferrari denounced certain Anti-Modernists who he said were just as bad as the Modernists. These anti-Modernist zealots discover Modernism all over the place, and even manage to throw suspicion on those who are very far removed from it. This did not endear him to Pius X and until the end of his reign, Ferrari kept silent. It is unsubstantiated that toward the end of his life Pius X said he had been wrong about Cardinal Ferrari. 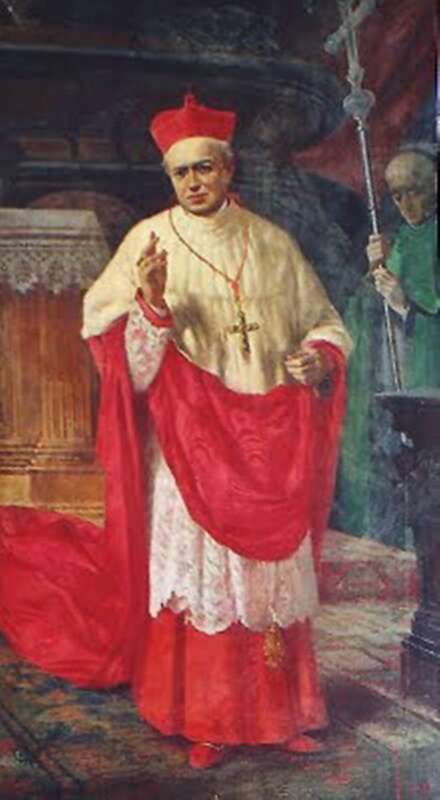 During the pontificate of Pope Benedict XV, Cardinal Ferrari was restored to papal favor. Among his diocesan priests was a newly ordained curate who taught Church history at a local seminary, Angelo Roncalli, the future Pope John XXIII. Roncalli knew the Cardinal well and had great admiration for him. On February 19, 1961, which was the fortieth anniversary of the Cardinal’s death, Pope John XXIII delivered a eulogy in praise of Andrea Ferrari whose words and example had inspired Pope John throughout his life. 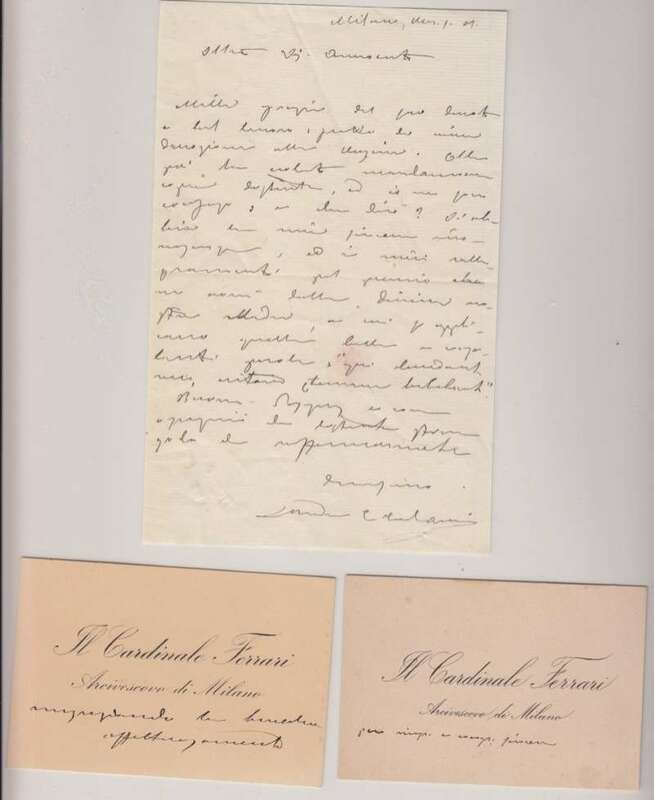 Another priest, Father Achille Ratti, the future Pope Pius XI, also came in contact with the Cardinal. Ratti had left seminary teaching to work full time at the Ambrosian Library in Milan. Ratti also succeeded Cardinal Ferrari as Archbishop of Milan after Ferrari’s death. Andrea Ferrari died in 1921 in Milan. 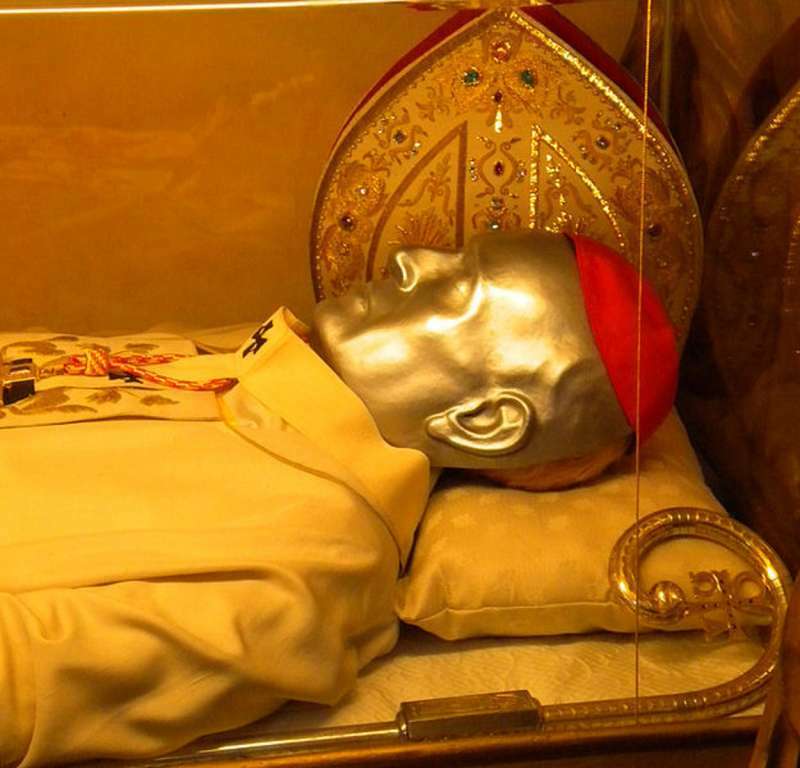 Pope John Paul II beatified him on May 10, 1987. This untranslated letter is signed by him. The two business cards have short messages in his own hand.